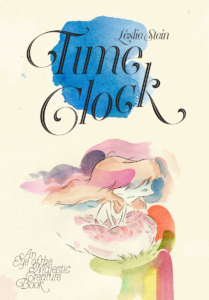 Cartoonist Leslie Stein joins the show to celebrate her new book, Time Clock (Fantagraphics)! We talk about her amazing diary comics (recently collected in Bright-Eyed At Midnight ), why she picked a really weird name for her ongoing comics project (Eye of the Majestic Creature), the artistic benefits of boredom, finding her style(s), drawing for online vs. print (and color vs. b/w), her strategy for surviving comic cons and festivals, how she got a gig publishing comics at VICE, the disconcerting discovery that she had an audience, and how she strikes a balance of cartooning, being in a band, and tending bar! Give it a listen! 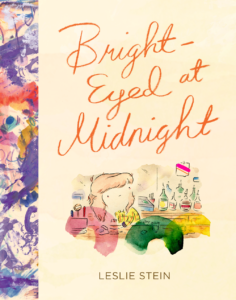 And buy her newest books, Time Clock and Bright-Eyed At Midnight (my personal fave of all her work)! This episode was recorded at the School of Visual Arts, where Leslie studied. Past guest Nathan Fox, chair of the MFA Visual Narrative Department at SVA, offered us a space to record. SVA’s low-residency MFA Visual Narrative Program includes two years online and three summers in NYC. The program focuses on the growing need for original content creators in advertising, video games, picture books, graphic novels, film, comic arts, illustration and animation, and it prepares artists and authors to become innovators in the ever-evolving art of visual storytelling. Now go listen to the show! Leslie Stein is a cartoonist and musician living in Brooklyn, New York. She is the author of the comic book series Eye of the Majestic Creature, as well as the author of Bright-Eyed At Midnight , a collection of diary comics, both published by Fantagraphics Books. She regularly contributes comics to VICE. She plays music with Prince Rupert’s Drops. Credits: This episode’s music is Nothing’s Gonna Bring Me Down by David Baerwald, used with permission of the artist. The conversation was recorded at the School of Visual Arts on a pair of Blue enCORE 200 Microphones feeding into a Zoom H5 digital recorder. I recorded the intro and outro on the same setup, inside a closet in Des Allemands, LA . Processing was done in Audacity and Logic Pro. Photo of Ms. Stein by me.